To enhance your ability to understand and critically appraise material you read. Everybody has different strengths and weaknesses when it comes to the GAMSAT. Below I’ve suggested 4 different reading lists depending on which skills you feel you need to work on. Improving your critical reading skills is not so much about what you read as it is about how you read it. Critical reading is when you read a passage or article while asking the question ‘Is this actually true?’ and then attempting to explain in what ways it is not. Newspapers are an easy place to start as they are, for the most part, bursting with misinformation and tenuous arguments. Your exercise in reading them, is to spot all the assumptions the writer makes constructing their argument. What things does he assume to be true, which, if false, would invalidate his argument? Write each assumption down as you come to it along with some reasons why it may not be true, or contexts in which the statement may be considered false. Read with the intention to disprove the author’s thesis. If you are coming away from each article thinking “yeah everything in that seemed reasonable and true…” then you may be struggling and I recommend starting with a tabloid like The Sun and working your way to more challenging material. I recommend these particular writers because, aside from being awesome, they provide a wealth of ideas related to politics, technology and anthropology – major Task A themes. They have the added bonus of being well known, so they are easily cited should you choose to do so. 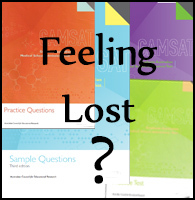 GAMSAT essays are not about regurgitation of information and historical ‘facts’ related to a specific topic. You don’t get points for knowing stuff. You do get points for expressing ideas. Un-creative people often feel like they struggle with generating ideas. A valid substitute for authentic creativity is to fill your mind with other people’s ideas. Reading strange and imaginative fiction is a great way to fill your mind with new ideas. Fiction is a useful setting because it allows the writers to develop ideas without the constraints of our generally agreed ‘reality’. The label of Fiction also allows the reader to let go and not worry about what is realistically possible, and find themselves absorbed in an entirely different world of thinking. – if you’ve read 1984 you won’t need to spend long thinking up your response to this essay title! Task B themes include ideas like happiness, love, friendship, meaning, belief and morality. This is a task that many GAMSAT students have the most difficulty with. This is because task B tests emotional reasoning as much as it tests critical reasoning. Task B is not an argument you can win. The information provided in the comments cannot be empirically verified by any means. Take off your labcoats, your goal for Task B preparation is to cultivate an emotional awareness. Stories and music are your best friends here. I hesitate to prescribe which music you should listen to – the important thing is to find some music that gets you to feel something. The task is then to be aware of your feelings as they arise when you listen. Know that other people have felt these feelings before and consider how you would describe them if you were to put it into words. If you are honest and accurate in describing your feelings it will be easier to evoke an empathetic response from your reader. The two songs I listed above are very popular ones. Can you figure out why? Don’t casually read things in the hope that new words will flow into your vocabulary. That’s passive, inefficient studying. Seek to actively improve your vocabulary and understanding of grammar and punctuation. I have another tutorial about this which discusses the types of words you should consider adding to your vocabulary.